Around noon Tuesday, Heather Thompson, the membership director at the Flagler County Chamber of Commerce for the past two years, was called into the office of Chamber President Rebecca DeLorenzo, who had hired Thompson. Thompson was fired. DeLorenzo won’t say why, citing human resource privacy matters. Interviews with most of those involved reveal that no overt strong-arming took place to silence the web support on Thompson’s behalf, though DeLorenzo and other key members of the chamber’s hierarchy—Howard Holley, a chamber board director, and Lea Stokes, a former chair of the chamber—did not sit idly by as the issue quickly and publicly unfolded. And Thompson aside, the insurrection appears to have opened a rift within the membership that Garcia is not certain can be mended as readily as the chamber board would like. 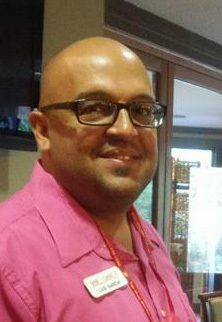 Garcia has been with the chamber 18 months. He chairs a lead group within the chamber that meets weekly, on Wednesdays, called the Chamber Business Connectors, which numbers some 40 members. “We help each other, we grow one another and we support the chamber,” he said. He is also on the membership committee and a diplomat for the chamber. In short, he’s the sort of hyper-involved chamber member the chamber craves. Members found out “out of the blue” when the firing happened, Garcia said, describing how Thompson read her termination letter, which she was required to sign. (She hasn’t done so yet.) “Some of the members, I’m not going to name them, but some of the members, including some of the board members, said what do we do? I’m a marketing guy. I know what I can do. 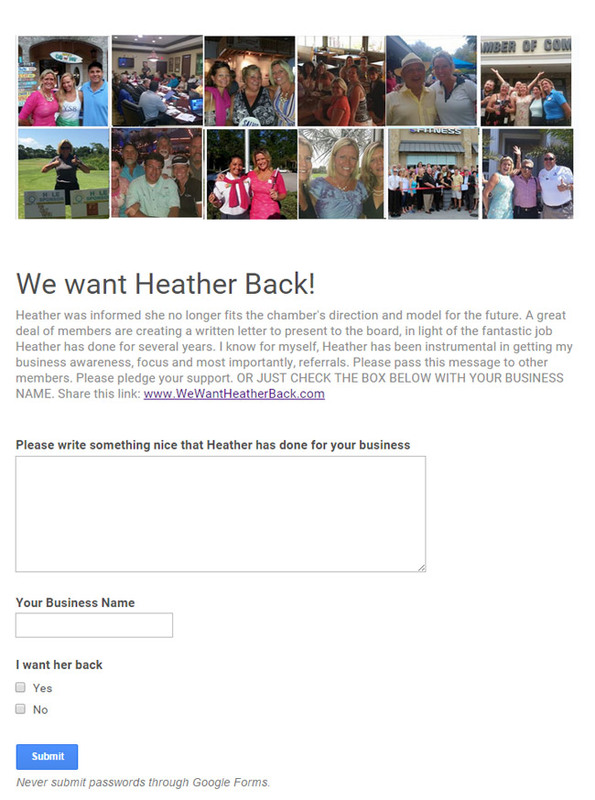 I said we should get testimonies for Heather.” He had a colleague secure the domain name wewantheatherback.com. He put up a page, and testimonies started coming in. As the testimonies are pouring in, Garcia gets a call from DeLorenzo who invites him to speak with her Wednesday morning before his 8 a.m. meeting with the connectors. Meanwhile he sends some of the testimonies to Sal Passalaqua, the funeral director at Craig-Flagler Palms who currently chairs the chamber board. The next day Passalaqua joins DeLorenzo for the meeting with Garcia. An outpouring of support for a fired staff member exposes a rift within the membership she built. “I said Rebecca, you can do whatever you want to do, it’s how you do those things that matter,” Garcia said. He was concerned that the firing took place without any consultation with board members or someone like him, as the head of the connectors group, though he was told that board members were in fact informed. DeLorenzo said she’d put him on the agenda to address the chamber’s executive board. Hours later, however, Garcia is informed that he would not be given that opportunity, the board having judged the matter a personnel issue within DeLorenzo’s purview, not its own. DeLorenzo was calling companies whose names were appearing in the testimonies. But her critics were overstating the case. Numerous companies were listed in the online testimonies, DeLorenzo said. “Except in one instance, it didn’t have an individual’s names, it just had a list of company names,” she said. In some cases, single individuals pay for their membership. In others, individuals are members of larger organizations that pay for the membership. “So I contacted a couple of those companies to verify if it was the company that had signed this petition or if it was an individual. I did that with four companies, and again it’s because the memberships are paid at a higher level than the person that was signing the petition, and the person that was signing the petition on behalf of the company’s name wasn’t authorized to do so. So that’s what I was just verifying. There were personal attacks and personal threats that went along with the comment section or were attached to the petition, so I was just trying to verify everything and make sure who was signing the petition, who was authorized to sign the petition.” In three cases, the companies said the individual did not have that authorization, nor was it the company’s opinion to be on the petition. As in the case of Mike Richards of Vector Security, Garcia removed the name of the company from the testimony, but the company did not object to having Richards’ name remain, which it did—until the page was taken down. Garcia recalls: “Heather calls me up and says this lady, Lea Stokes, is calling her up now, she’s on the executive board of the chamber, and Heather is like, I don’t know what to say. So I said Heather, you didn’t do any of this, I did this.” He then amended that to “we did, as members.” Thompson then had a conversation with Stokes, following which she asked Garcia to take down the page. Stokes had alluded in a voice mail to “repercussions” if the page stayed up. Stanley Drescher is Flagler Beach's poet laureate. He contributed this poem after this article posted. Garcia doesn’t dispute the terms. In his meeting with DeLorenzo and Passalaqua, Garcia had said: “We were going to go on to phase two, and that was like a low gut blow, to put them on notice. They didn’t like that. They didn’t like the phase two part.” He didn’t explain what the phase two means, other than that it was related to a form of protest. “Heather made the decision to pull it,” Garcia said of the web page. “That morning they didn’t like it. They didn’t strong-arm me in the morning, but then Heather was saying maybe we should freeze at 50 right now and regroup. So I did.” In early afternoon, Garcia gets a call from Howard Holley, the former county commission candidate who, beside being a chamber board member, works with the chamber on its marketing and advertising ventures. Note: the testimonies about Heather Thompson appeared on a web page called wewantheatherback.com, which was up briefly this week. A screen shot of the page appears below, along with the testimonies as provided by Luis Garcia, who created the page. has worked as hard should be excused so easily. “Fantastic Public Relations Bussiness and diligent active networking. could do for them and how great this chamber is, EVEN ON HER OWN TIME! skills to help all businesses succeed that come into contact with her. inclusive nature made us feel welcomed and more than that, friends! 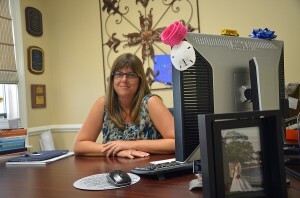 Heather has been nothing but a go getter in her role at the chamber. Well first off she has always shown me a warm welcome with big smiles! to help members, to bring in new members and to set up amazing events. all of the events. Now Heather is the only one always present. and with a great big real smile. as the true professional that she is. Yet another example of why our county is perceived as Slimier than a Greased Pig eating Okra. From the above it seems that Heather was quite popular among more of the newer members. This is logical since her job was to build membership. However, if someone is relieved of their duties, there must be just cause , one would assume. Until (and if this ever gets revealed) the PR process unfolds, the media will surely make this a very divisive, and dysfunctional type organization. The Chamber plays an integral part in the County’s image for business friendly qualities. There must be a quick healing or progress may be compromised. Palm Coast has business friendly qualities? Since when? Our reputation in the state says otherwise. Notice how they are building and growing all around us, but not here? It sounds to me like jealousy may have played a role here somewhere, and that would be very sad. From the article, it sounds as if the Chamber accounts feel that Ms. Thompson is quite valuable. What does Mrs. DeLorenze bring to the job? A husband on the City Council? I have avoided this Chamber because it really never seemed to function as freely as do other city Chamber offices. It feels more political than business related. Ask the business owners here in the community what they think. I’ve heard many say they never hear from the Chamber unless it’s time to collect dues and that they can’t justify the cost of joining as they get so little in return. A good Chamber needs to be everywhere in the community, the first place you go when needing assistance on all levels. The goal needs to be 100% participation and if that is not happening, then something needs to change, otherwise you are wasting your Chamber dues. I wish the Chamber well in working this out. There is no question that many are not happy. I hope they can reach a solution that pleases all. It isn’t their Chamber, it belongs to us all as it receives taxpayer funding and should be a reflection of the community and the first place to put of the welcome mat and be there to assist. If it is not functioning in that way, changes need to be made. In my opinion the Chamber is a waste of money and business owners who are not in the click are left out in the cold. The cost of the operation of the Chamber far out weighs the benefits therefore the Chamber should be dissolved. The Chamber here in Flagler County has been disfunctional for years. Rebecca DeLorenzo needs to get out in the real world and find her self a real job. When I moved back to Flagler County several years ago, I had the “pleasure” of interviewing with Ms. DeLorenzo and then a second interview with whoever the CEO was at the time. I declined the position having accepted one with the State but am not all surprised by what happened here. That place, in my opinion of course, reeked of “good ole boy syndrome” and I feel fortunate that I made the right decision. Under the current leadership, I would not support the Chamber or the YPG which is affiliated (a big reason I refuse to join). I’m only sorry that Ms. Thompson undoubtedly got the shaft for likely more politically motivated reasons than anything else. Political BS. That’s what it boils down to. Hope you have many boils in the future. Love you. This story isn’t making any sense. Also sounds like the Chamber needs to get their act together. Why is turnover so high? Perhaps it’s time to rethink who heads the Chamber? “I’m scared. It’s a small town.” Quoted from Heather Thompson. Really. Wow the small town folk like to scare people. This is criminal. Looks like Heather maybe did to good of a job, you can’t out perform a council members wife!!! The one thing that is very important in this article that the members should keep in mind is that . . . it is a Member organization. The member is the customer, and without the members . . . do they continue to exist? Here’s just some of the words Declaration of Independence that we celebrate this weekend . 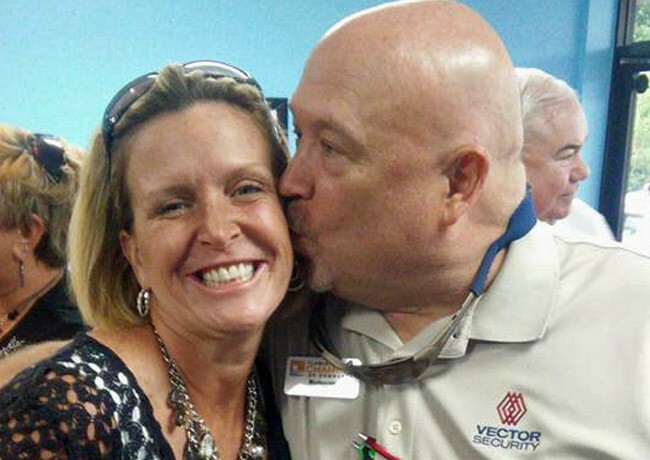 . .
Heather is a fantastic individual who gave 100% to her position at the chamber. She was, by far, the most visible and energetic staff member at the chamber. As a member of the chamber (Teens-In-Flight) I must say I am disappointed in the way this dismissal was handled. In dealing with the discharge of a employee, it is inherent that management do their due diligence by counseling and keeping copious notes about these sessions. Further, the employee must be given written notification of stated performance issues and a chance to correct these deficiencies. In other words, all i’s are dotted and t’s are crossed. I think if Heather seeks legal recourse, her attorney will find glaring holes in the chamber’s handling of this termination. I know that I will not be renewing my membership with the chamber until significant changes are made! Boy did they Fire the wrong person.Im a member and think the Chamber should be put in the hands of the State, maybe then they will be able to do something right. It is a small town here. There are not a lot of options for employment here period….Heather, looks like you are very well liked in this “small town” I’m sure one of those companies that signed the petition and wrote those very nice comments will hire you? Unfortunately your situation has now played out in the public and “drama” has been attached to your name. The fortunate thing is that the gossip mongers, trouble makers will soon forget when the next “juicy tid-bit” hits their radar or flaglerlive and it will be forgotten. I wish you the best..
Really, does this really surprise anyone? The Chamber was duped into supporting a massive Hotel project crammed into the HB wrong location, no water, sewer availability and without any closure to sensitive environmental issues, given small acreage. No detailed questions or foresight as to this plan, COC just enamored with a ‘marathon talking’ individual. Anyway, this is what you get….hats off to those who try in this very important role, but a refresh is needed. Well at least the loons can’t blame Kim Weeks for this. Just another example of what’s wrong with this county, it’s government and its leadership. This county needs to look deep down at it’s self and fix it. Some advice to Thompson: It is difficult to fire an employee unless there is a history of justification for the firing. In other words, there must be a written record each time there is “wrong” and it must be discussed with you and you must sign off on that record or notification. If this has not occurred in this case, I would seek the advice of an attorney. You have a case. Florida is an employment-at-will state. An employer can terminate an his or her employee at any time for any non-discriminatory reason; or, no reason at all. Is it smart business practice to discuss any issues with employees before terminating them? Absolutely. But, in the absence of an employment contract, there is no legal requirement to do so. Of course, any terminated employee is free to allege wrongful termination and seek the advice of counsel; however, the burden of proof falls on the employee. The best advice for Heather is to not take any advice from those who do not understand Florida labor law and are not an attorney. I would agree completely. But I would also advise Heather to seek that counsel. Until the strength and power of Flagler’s not so silent mafia – a.k.a. the realtor’s association – is ended, this county will amount to nothing. Excellent comment. Again, development all around us, but not here. Somebody not paying enough money? Would PC Dad say more about the “not so silent media”? What in the world do you mean? Please elaborate. Thanks. Maybe she was doing too good of a job. Did she pose a threat? Luis strikes me as the classic “guy that doesn’t get it.” The President runs the company…not the board. It’s the President’s decision to make. Why someone is let go is none of his business. If Heather was so good for his business, maybe he should hire her? There’s two sides to this story, and we’re only hearing one that makes the chamber look bad, presumably, because there’s not much more in Flagler County worth talking about. By the way, the chamber’s reason for existing isn’t to help Luis get more likes on FB…or whatever he’s doing. It’s to improve the business climate of a community, to advocate for businesses. Single-handedly, Luis negatively impacted that because he doesn’t agree with an employment decision and decided to make a public scene instead of handling himself like a professional. Get over yourself, pal. About the strong-arming…uh…hello, McFly? If a company (member) that spends tens of thousands of dollars with you (chamber), signs a petition that says their upset with you (chamber)….THE RIGHT THING TO DO IS TO CALL THAT COMPANY! Is that really hard to figure out? One of my clients appears on a website that is upset with an action I took? The president is correct in reaching out to those companies to learn more. As a matter of fact, if she didn’t, that would have been a criticism. What it sounds like we found out was underlings at a few of the companies misrepresented the actual leadership of their employer. That’s a big deal for those companies as their brand is now impacted for hiring ying-yangs that want to speak for their entire organization. Non-profit management is a tough business. I used to do it, so I know. I keep coming back to the ring-leader, Luis, on this one, though. He made the decision to take this to another level. He should have conducted himself better…but he won’t understand that line of thinking, I’m sure. I guess the good news is things are going so well in PC that an underling at the chamber getting fired for whatever reason makes the news. Psh… Wake me up when there’s real news.